When Queen Elizabeth II receives her guests at Windsor Castle today to celebrate 60 years as head of the British state she will be greeted and fawned upon by some of the world’s most ruthless dictators. Some 40 sovereigns from around the world are invited to the celebratory lunch to mark the queen’s Diamond Jubilee, six decades after she accessed the British throne in 1952. A spokesman for Britain’s House of Windsor said the occasion would be an historic and intimate gathering of crowned heads. Among the attendees will be the queen’s counterparts from other European royal households, including sovereigns from Spain, Denmark, Sweden, Andorra, Belgium, Luxembourg, Monaco, the Netherlands and Norway. But also in attendance at the lavish banquet will be the kings, emirs and sultans of the Persian Gulf monarchies: Saudi Arabia, Kuwait, Bahrain, Qatar, United Arab Emirates and Oman. While the European royal counterparts can claim to be antiquated throwbacks to centuries past, who now possess largely ceremonial titles that do not impinge on the democratic workings of their societies, not so the Gulf monarchs. For these are absolute rulers who preside over their subjects with ruthless and untrammelled power. The oil-enriched dictators do not brook the slightest public dissent, and invariably command their state treasury and army like fiefdoms. The most controversial of the latter guests to the queen’s Jubilee is Bahrain’s King Hamad bin Isa Al Khalifa. King Hamad is also believed to be among the honourees who will be entertained this evening by Prince Charles at a special commemorative dinner for his mother at Buckingham Palace. The Bahraini royal’s invitation has sparked protests from human rights groups who point to the year-long brutal crackdown against pro-democracy protests in the tiny Persian Gulf kingdom, which has resulted in more than 80 civilian deaths, and thousands of wounded or imprisoned. Since Bahrain’s mainly Shia population took the streets in February 2011 to protest against the unelected Sunni royal rulers, dozens of protesters, including women and children, have been shot dead by live fire or suffocated in their homes from massive use of teargas. Some of those detained in Bahrain’s secret dungeons have died from torture at the hands of the regime. As the supreme commander of Bahrain’s armed forces, King Hamad has blood on his hands. Not only the king but his sons as well. 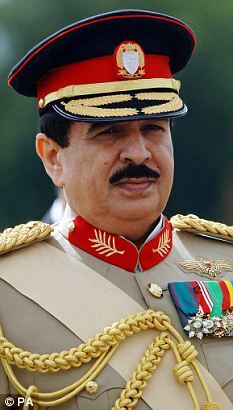 Crown Prince Salmon is the kingdom’s second in command, as deputy head of the armed forces; while his half-brothers, Princes Nasser and Khalid, who are also senior military officers, have been personally involved in torturing hundreds of protesters, according to the Bahrain Centre for Human Rights and also several personal testimonies given to Global Research. The invitation of Bahrain’s king has not gone unnoticed by the British public. Indeed, his anticipated arrival in London has caused a media stir with condemnations even from the royalist Daily Mail over the queen’s invite to the “despot of Bahrain’s bloody regime”. The House of Windsor has responded with typical British dissembling, saying that it is only “following protocol” in such matters by “inviting all monarchs from around the world”. But such limp-wristed posturing cannot disguise the fact that Britain’s royal family is closely linked to Bahrain’s despotic rulers. The Al Khalifa dynasty, which originated as a Bedouin raiding tribe out of Arabia, was brought to power in Bahrain some 230 years ago against the wishes of the indigenous people, by Britain to safeguard the latter’s imperial trading routes in the Persian Gulf. Ever since, the Al Khalifas have ruled over Bahrain with predatory power, enriching themselves on the island’s oil wealth at the expense of the Shia majority – and this despotic elite owes its privilege to exploit to Britain’s ruling class. 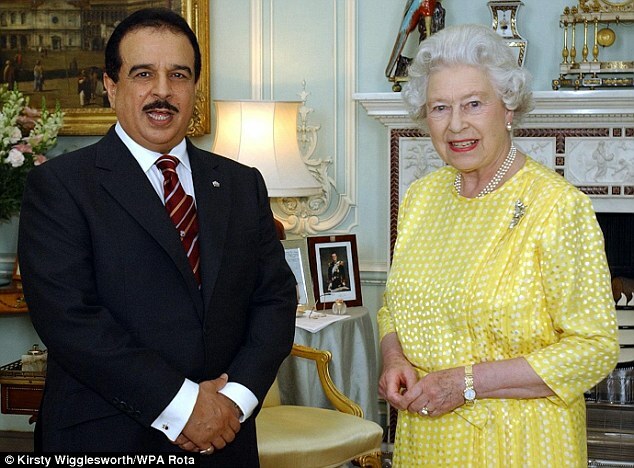 In 2004, two years after Hamad was enthroned in Bahrain, he was received by Queen Elizabeth in Buckingham Palace. The following year, he was the only foreign sovereign head of state to be invited to the wedding of Prince Charles and Camilla Parker Bowles. British-educated at private colleges in Surrey and Cambridge, the young Hamad underwent military training in the 1960s with the British army at Aldershot. He later also graduated from the US Army and General Staff College at Fort Leavenworth. 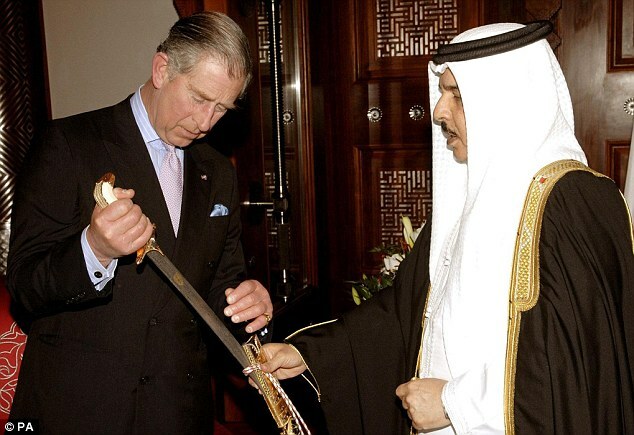 Prince Charles, who is the head of the British Parachute Regiment, was received by King Hamad in Bahrain in 2007, where he was presented with an ornate sword, presumably a symbolic gift from one ruler to another. Last December, King Hamad was given the red carpet treatment in 10 Downing Street by British Prime Minister David Cameron while repression was raging back in the villages of Bahrain and its capital, Manama. The British government had just then signed off on a $3 million weapons deal with its former Persian Protectorate. The same month, Prince Charles’ younger brother, Edward, the Earl of Wessex, and his wife, were given a royal welcome in Manama. The Countess of Wessex later came under public pressure to return several gifts of jewels and pearls bestowed on her by the king, crown prince, and the king’s aging uncle, Prince Khalifa bin Salman Al Khalifa, who has served as the unelected prime minister of Bahrain – the world’s longest PM in office – since the island gained nominal independence from Britain in 1971. This was not the first time that the cosy relationship between Britain’s royal family and the Khalifas courted controversy. Last year’s royal wedding between Prince William (son of Charles) and Kate Middleton was marred when public outrage resulted in Bahrain’s crown prince “declining his invitation”. At this year’s British royal Jubilee, Queen Elizabeth may claim that she is merely following polite protocol by inviting the King of Bahrain and the other Gulf monarch’s to her celebrations. But the significance goes much deeper. These Persian Gulf dictators have blood on their hands, both at home and abroad. All of the Gulf states sent forces into Bahrain last year to crush the pro-democracy movement, and these forces continue to oversee a ruthless crackdown, with weapons supplied by Britain (and the US). The Gulf monarchies have also served as key diplomatic and financial supporters of the Britain’s neo-imperialist wars in Iraq, Libya and covertly in Syria. 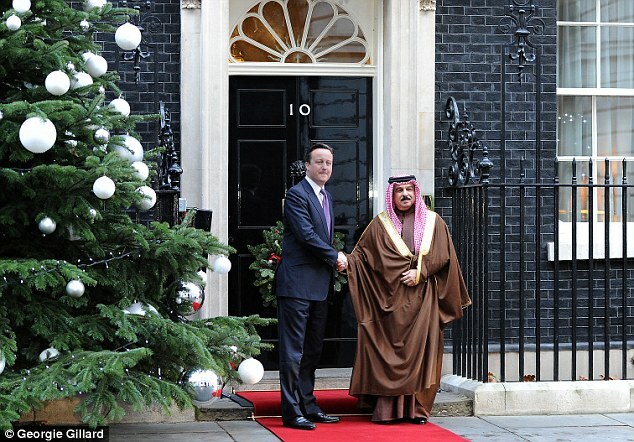 The Gulf dictators are not just symbolic of Britain’s imperialist past. They are vital consorts in Britain’s present illegal wars of aggression. As millions of Britons today suffer poverty, unemployment and homelessness, those British royal subjects are entitled to feel anger and disgust at the banquet for despots and dictators hosted by their Queen Elizabeth.